There are a great many mysteries still to unravel in the cosmos, and we may be one step closer to solving one of them thanks to machine learning. Scientists from the University of California, Berkeley SETI Research Center have turned an AI loose on fast radio burst (FRB) data from 2017. These momentary flashes can outshine millions of stars, but we don’t know what causes them. The new AI-powered analysis detected more than three times as many FRBs than previous scans showed. As impressive as this feat may be, we still don’t know what causes the flashes from FRB 121102 (or any FRB source for that matter). Some researchers think they have something to do with supernovas or pulsars (rotating neutron stars), but there’s also a possibility FRBs could have some connection to extraterrestrial intelligence. That’s why SETI is interested in the phenomenon. The data in question comes from the Green Bank Telescope in West Virginia, which scanned an object known as FRB 121102 in August 2017. FRB 121102, which resides in a dwarf galaxy some 3 billion light years away, is a hot topic in astronomy circles because it’s the only known source of repeating fast radio bursts. All the other FRBs detected since their discovery in 2007 have been one-off events. Previous analysis of the data from that day in 2017 showed 21 FRBs coming from FRB 121102, but that may be just a fraction of what’s really there. The SETI researchers led by doctoral student Gerry Zhang trained a convolutional neural network to detect fast radio bursts in data sets collected by telescopes. The team calls this the “Breakthrough Listen” project. The technique is not much different at a technical level than using a neural network to identify objects in a photo. After teaching the network what FRBs look like with labeled data, it can then make accurate assessments with fresh data. 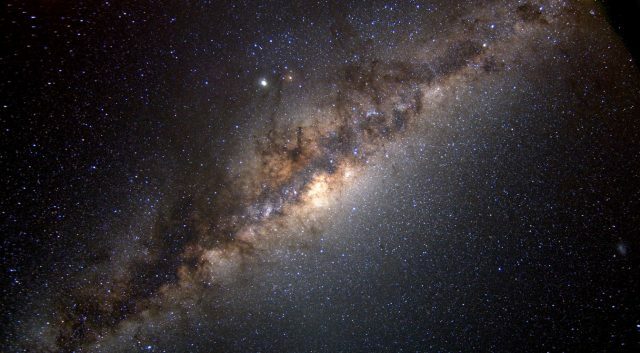 The only repeating FRB ever discovered, located in a dwarf galaxy 3 billion light years away. Breakthrough Listen combed through the 400 terabytes of data from the Green Bank Telescope, which contained 21 known FRBs. The AI pointed to 72 additional flashes, bringing the total to 93 fast radio bursts from FRB 121102 on that single day. Having a better accounting of FRB activity will help astronomers develop models to explain the signals. Using technologies like Breakthrough Listen, we may even find that other FRBs repeat in ways we didn’t detect previously.